Bicentennial Capitol Mall State Park, located in downtown Nashville between Jefferson Street and James Robertson Parkway, was designed by the local architectural firm of Tuck-Hinton in the style of the National Mall in Washington DC. The park, as its name implies, was built to commemorate and celebrate the 200th year anniversary of the state of Tennessee. 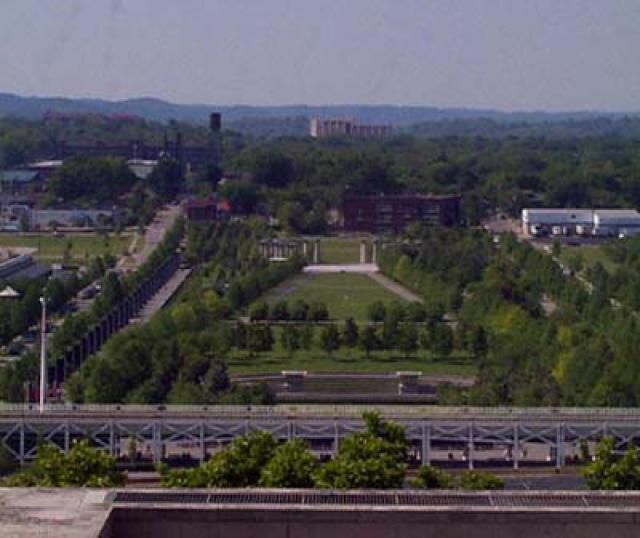 Bicentennial Mall, as it’s commonly called, is really a free outdoor museum and is the focus of this walking tour. We start our tour of the Bicentennial Mall on 7th Avenue in front of the railroad trestles. The old creosote soaked wooden trestles have been replaced with modern architecturally ascetic steel structures. At your feet you will find a 200ft wide granite map of the state of Tennessee, complete with the 95 counties and all of the major rivers and tributaries of the state. As we walk underneath the trestles we see the major attraction of the park for the kids; the “Tennessee Fountains”. Thirty-one geyser like fountains, which represent the thirty-one most predominant waterways of Tennessee. Within this area, you will also find a welcome center and some picnic tables. There are four ways to walk through the park, two paths on the outside are the Pathway of History and the Walkway of the Counties, and two paths on the inside of the wall are the Path of Volunteers. It is recommended that you walk each path, as there is plenty to see and discover throughout the entire park. As we walk farther east and turn to the north, we see a wall of history, entitled the Pathway of History. This is a 400ft long granite wall etched with dates and tidbits of information detailing a historical timeline of the state. The wall starts with information on the states early inhabitants and continues through to modern times. You will notice that the wall breaks apart at the time of the civil war, to represent the state of the country during this great conflict. As you walk through the park, you will notice the many plants, flowers, and trees, which are native to the state. Along the Pathway of History there are a few notable stops. One is McNairy Springs, a monument and fountain that represents the founding of Tennessee. McNairy Springs actually sits on top of the original sulphur spring that fed the Old French Lick Creek. Our next point of interest along the Pathway of History is the WWII memorial, which contains huge pillars of black granite photo etched with images from the battles of WWII. There are also short descriptions below each photo that describe the images and their importance to Tennessee history. These granite pillars surround a very impressive 18,000-ton black granite globe that floats and rotates on a 1/8-inch bed of water. The globe is etched with markings of how a globe would have looked during WWII. Here you will find seven benches that represent the seven Tennessee recipients of the Congressional Medal of Honor. As we come to the center of the park, we find the Tennessee Amphitheater. This area is fashioned after an ancient Greek Amphitheater. Concerts, plays and other outdoor activities are held here throughout the year. Our next area of the tour is the Court of 3 Star located at the end of the park. This area is a large red, white and blue circle that represents the center of the state flag. The 3 stars represent the 3 geographical land formations of the state, The Mountains of east Tennessee, the hills of the mid state area and the flat lands of western Tennessee. Surrounding the Court of 3 Stars, you will find 50 large Greek style columns that contain 95 bells. The bells represent the 95 Tennessee counties. This type of music structure is called a carillon. The carillon plays part of the Tennessee Waltz every 15 minutes; it plays the complete song each hour. As we proceed along the path, walking back toward the capital, we come to Walkway of the Counties. Each of Tennessee’s 95 counties are represented by a marker which contains time capsules that are to be opened during Tennessee’s tricentennial in 2096. Out last recommended area of interest concerns the buildings to the west of the park, here you will find the latest incarnation of “The Farmer Market”; as you walk through the buildings you can browse the fresh home grown produce from local farmers, along with the best meat products that Tennessee has to offer. The center building contains international markets, along with a food court offering fare to suite any appetite. For those of you with an iron stomach, you can also find a store that offers the largest variety of hot sauces available in the state.